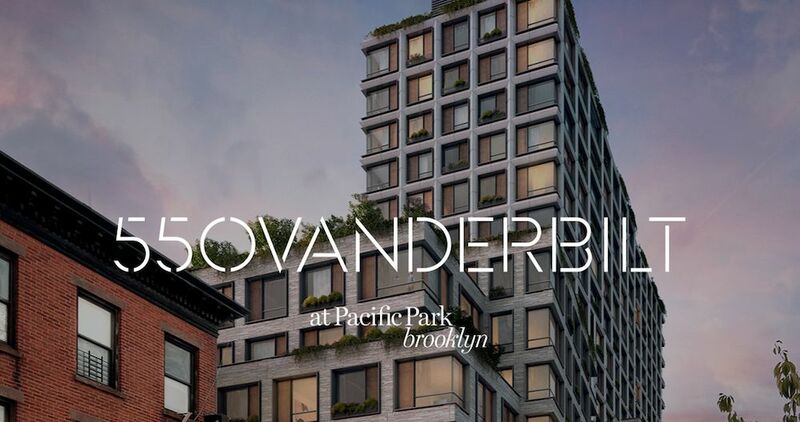 A teaser site is out for 550 Vanderbilt Avenue at Prospect Heights mega-project Pacific Park (formerly known as Atlantic Yards). Designed by COOKFOX, 550 Vanderbilt is a 17-story building with 278 condominiums, ranging from studios to four-bedrooms. The project will be the first condominium to be built at Pacific Park. The three-bedroom and four-bedroom units will be available in single-level and duplex layouts, according to the teaser site. Pricing starts at approximately $550,000 and goes up to about $5.5 million. The building on the northwest corner of Vanderbilt Avenue and Dean Street will have a facade of masonry and precast concrete with large windows, inspired by the brownstones in the neighborhood. The minimally detailed structure matches the 60-foot street wall of Dean Street and has gradual setbacks, allowing for lots of light and views, according to 550 Vanderbilt reps. Residents will be able to see the adjoining eight-acre park from the lobby, elevator vestibules and the apartments themselves. The development includes more than 10,000 square feet of amenities, including a 24/7 doorman, concierge service, eighth-floor landscaped roof terrace, resident lounge with fireplace, library, children’s playroom, guest chef’s kitchen for entertaining, gym and live-in superintendent. Residents will also have access to bicycle storage, private storage units and underground parking. Corcoran Sunshine Marketing Group will launch sales for 550 Vanderbilt this summer, according to building reps.
Greenland Group and Forest City Ratner Companies partnered on Pacific Park, which will eventually encompass 14 apartment buildings with 6,430 affordable and market-rate units. The mega-development’s residences will be connected to eight acres of open green space designed by landscape architecture firm Thomas Balsley Associates.